Francis McNamara was an expatriate American who built Formula Vee and Formula 3 cars in Germany in the late 1960's and early 1970's. His career as a constructor came to a sad end in the early 1970's, with his wife dying suddenly, and McNamara being investigated by Interpol, before suddenly "disappearing". Could anyone fill me in on more of the details? Edited by Graham Clayton, 11 April 2016 - 04:57. Only thing I can add at this point is that I think I believe he also built Indy cars. ... which David Hodges described as "outstandingly ugly". Having checked, I don't think they look any uglier than some of their contemporaries. McNamara built Andretti's 1970 STP car and the much less successful 1971 model, run by Andretti and Krisiloff. Krisiloff's engine blew on lap 11 of the 500 and Andretti was one of several drivers to spin on his team-mate's oil, hitting the wall as a result. Towards the bottom of this web-link are some photos of Jim Malloy racing a STP sponsored Indy-Car at the November 15, 1969, Bobby Ball 200 USAC Championship Race, held at Phoenix, Arizona. The #20 STP chassis is one of the infamous McNamara cars that Andy Granatelli commissioned for Mario Andretti to drive at Indy that year (1970). Andy always wanted to succeed with something innovative, and McNamara had built some successful minor formula cars in Germany the previous four or five racing seasons. Most of their success came in Formula 2. The picture mentioned is of one of the Granatelli Lotus 56s reworked to take a Plymouth engine. Niki Lauda was a works McNamara F3 driver. I saw the cars at Mallory Park and they were quiet pretty. Unfortunately they were not very successful! Edited by Stephen W, 03 May 2009 - 08:57. The picture mentioned is of one of the Granatelli Lotus 68s reworked to take a Plymouth engine. I think you mean 56s, don't you Don?! They were raced in 68, which I am sure you know already and your brain probably thought one thing and wrote down another! Also, my understanding is that these cars were not actually the 56s reworked but facsimile copies of the 56s made by Granatelli's team and fitted with a stock block engine. There is a note to this effect, quoting Vince Granatelli, in the back of Andrew Ferguson's excellent 'Team Lotus: The Indianapolis Years' book. Does anybody know what happened to the unfortunate Mr McNamara? The 701 saga: was the replacement tub for '03' the one that McNamara built or that he modified to such an extent it wnded up as a rebuild? I go back and forth on this one. I tend to think that it was the latter, but building a 701 tub could not have been all that difficult, so there is good reason to think that the replacement was built by McNamara. However, I am inclined to accept your word for it since does make sense, considering how different it was by the end of the season. I think most of the mods on the 701 were in the cooling/uprights/suspension/oil tank dept, IIRC, rather than the tub, but I wouldn't claim any special knowledge on this subject. I would have thought they just strapped in a new tub rather than going to all the effort of building one themselves... According to Bob Dance, after its Osterreichring shunt the car was rebuilt 'with a new chassis' in the US in the Autumn for the Tasman series. It was then crashed again, IIRC, by its new owner - John Cannon or Skip Barber, I don't have the info to hand to say which one! According to one of the books I have about March (the Alan Henry one) the design revisions on the 701 were done by Jo Karasek. Very interesting person, Francis McNamara, he built his first car was the McNamara Vee. This car was looking very good, I don´t know where the car is today? by McNamara 1969 with 19 years? Yup, that's the very same Gunther, he was very, very quiet back then. 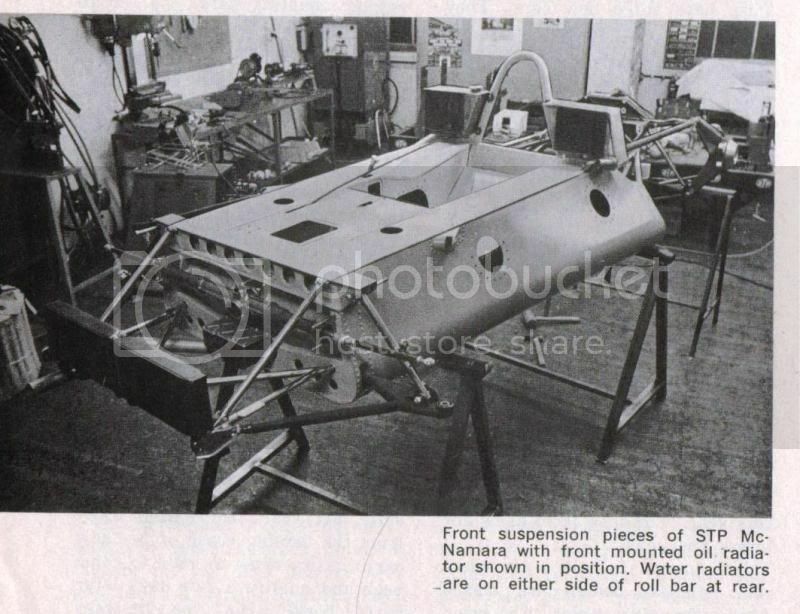 BTW McNamara never really had a Formula II, in the end we worked on various items, doing re-engineering. There was a March FI which Andretti was driving, an Interseries car and then the Indy Car Project which helped kill the company, by overstretching its finances. The smaller Formula cars back then were all space frame designs and our were probably stouter than say, stuff put out by Lotus which used horrible inferior quality seamed tubing which often split open under compression. Virtually ALL smaller formula cars back then were just copycat designs from each other and I feel that the McNamara's were probably the better of the lot, actually making some cars for Winkelman for a brief period. The Design of the Indy cars explored newer technologies and aerodynamics which were still in the infancy for almost all racing cars back then. All of us would just hand winglets here and there and for a while FI races looked like sets of movable picket fences flying around. A German Experiment showing that by simply inverting these early wings, FI cars could easily FLY with little effort. Luckily safety has increased a great deal and drivers no longer pilot rolling gas tank bombs as back then. at the moment i ""restore""a brand new mc namara formula . what do you thing , is this now an original car , build from original parts after 40 years????????? are there any more questions about MC , i may can find out for you ? did you know that peter arundel was working for mc. as well ????? take over after the finish from mc namara ) , in armins garage in bad tölz . they get an renauld f3 engine from albert in wörgel (austria). who can remember the mc namara capris ????? who can remember that bob dance was woring for mc namara ???? a few years ago gustav gave me all original mc drawings he had left over from his mc time . why , karasek the designer of the mc came from brabham . who can remember the kmw sports `s car ???? and minilites in the back . there is much , much more to tell . The Joe Karasek 1967 Sport car KAR -CAR Mach 1 fitted with a 520 Bhp Chrysler V8 engine .The car was presented to the press in Vienna , Austria , early 1967 and said to have been privately tested by Jochen Rindt . from the front, there is a strong filiation with a GT 4O , isn it ? It was said on the press presentation ( CAR AND DRIVER and french mag MOTEURS that I have)Rindt planned to enter the 1967 Austrian GP , then a 500 km sport car race, which he didn 't . But is that story about Rindt project was true, or simply a rumor ? john falky , did you work for mc namara as well ? when ? what was you job ? I always thought that the McNamaras were nice little cars, it's a shame that they never had an opportunity to show their true potential. Wow, two years after my first reply, i was correct with Gustav Brunner, Mc Namara Fvee car first i saw in the old Formula Vee film from VW 1968 with speaker richard von Frankenberg in Hockenheim Juni 68. Thank you Roger! f3 . but after a short time at mc he died . Frances McNamara was an expatriate American who built Formula Vee and Formula 3 cars in Germany in the late 1960's and early 1970's. His career as a constructor came to a sad end in the early 1970's, with his wife dying suddenly, and McNamara being investigated by Interpol, before suddenly "disappearing". I worked at McNamara's during 1968/69 building Formula Vee and F3. frank was an ex lieutenant (Green Beret) base at Lengreis on the German Austrian border. We started building Vees designed by Dan Hawkes, an engineer from Lotus and driving instructor fro Motor Racing Stables at Brands Hatch. The original cars up until Dan died were known as McNamara-Hawkes Sebring Cars. The vees were the first cars to have a fully plumbed in fire extingusiher system, anf were bench mark cars for the formula during 1969. The F3 was a very neat and pretty car. We lept from being a F Vee builder to running F1 and building Indy cars in just 2 years. as with all things that flash so bright to begin with it all burnt out tragicly in in just less than 4 years. I am currently restoring an original Sebring Mk1 FV that has spent its entire life with Andre Pilette and the racing school at Zolder. It won a championship in 1969 driven by Jean Charle-Goris. It is the onlty completely original example I have found. It should be out racing in the UK this year. I worked at McNamara in the Fiberglass shop, still have the work permit, one of the brochures in mint condition, and a pay stub. How did we live on so little money? The first FV was already obsolete when I started there and the last model, with very Aerodynamic bodywork on which I helped make the body molds was one of the jobs on which Gustav was involved. I also helped build the molds for the racing Capris and made endless series of hoods, trunk lids and doors, later seeing my handiwork in action. The fiberglas shop was well run and managed by Tony Waterman, who is still active and owns TW mouldings in England. The Indy car project ruined McNamara, the STP staff sent over was difficult, and spent McNamara money. The Marketing Manager, after a dinner date, described Andy Granatelli as a "Pig". Andretti visited the fiberglas shop got his jacket caught in some gel coat and left quickly, almost falling down the stairs. To this date, he refuses to answer correspondence I send to him. After I sensed failure in the company I left and worked for KG Murdock Lotus in Ramstein and Kaiserslautern. When McNamara failed I returned and helped to make the mold for the KMW cars, shipping the bodies to the assembly shop on top of my VW bus. Then I left for the United States, did some racing work in the Southeast and finally traveled to Tucson Arizona where I still reside, having done some 20+years work in Aircraft Maintenance, manufacturing and Engineering and now designing heavy mining equipment. The McNamara era was short, typical of the period and probably would make a very good movie. By the time Bonnie died the company was in trouble, having lost its steam and drive. The actual STP McNamara Indy sits in a museum owned by Don Garlits. BTW ALL racecars from that period were basically unsafe. On the Indy Cars, the drivers were surrounded by fuel tanks, same on Most Porsches, Ferarris and so on. Pits stops were extremely dangerous for both the mechanics and the drivers. No safety equipment of any kind for the pit crew. At one Daytona IMSA race I was fueling a Porsche when the party holding the fuel can lost his balance. The hose I was holding on the filler neck came loose and I got 20 some gallons of gas all over me. As a result of this incident everybody around me ran away and I finally found a water hose and cleaned myself off. Basically after that my racing urge was also cleaned off. According to E mail I have received from Tony Waterman and checking the Google satellite images, the McNamara buildings in Lenggries are gone and a hotel complex now sits on the property. BTW, the F3 cars were just as good or bad than any other ones out there. We helped Lauda many times on his cars "off the clocK" I hope one of these days he might say "thanks" even after all of these years. I have a question: Drove the first McNamara FV in Hockenheim Juni 1968 and was the car in white? I have a old movie where it can be that the car drove first time? 1968 on Nürburgring südschleife Septembre the McNamara drove too. It is interesting to note that we always think of 1970 when speaking about the McNamara Indy car. That was indeed the year when a "real" car appeared in the hands of Andretti at various US meetings (I know at least of two). However, as far as I understand another car was planned for 1971 and there had been some photos published showing Andretti in trying it for size around March / April 1971. I suppose that must have been the Indy project that killed the operation, not the 1970 car. The unfinished remains were offered for sale by someone from Munich as late as September 1972 (i.e about one year after the operation had faltered) "for F2 - F5000". Any idea whether these remains have ever been turned into a running car of any kind ? McNamara built TWO distinct Indy car designs, The first one, very angular, with a tall cover over the Ford Engine. The second design was very different. It is the second design that was destroyed in an accident. But the first car appeared to have been quite good, finishing 6th despite a driveshaft problem. However, on this 1st car a big rift developed between some of the Granatelli staff and some McNamara people, apparently due to different concepts of what should be done to the cars. I suspect that Granatelli's management style which was a mix of Mafia boy and Heinrich Himmler didn't go over too well. By this time I had decided to leave the company and I was not working on the Indy Cars anymore, being stuck in a different area working on Formula Ford and Formula Vee molds. I still have pictures of the Fiberglas shop and the facilities and some pics of the cars at an Airport Race close to Munich. What I will do in the coming weeks is to post the images in good resolution on my Netsite so all can have a good look. Also: McNamara had 2 distinct FV designs. The 1 one was designed in a partnership with Hawkes who had a heart attack and drowned in a large Bavarian Bathtub and which I found to be a rather outdated dog of a car. However, the second design was very advanced, very Aerodymanic and went on to a winning career even after McNamara no longer existed. Very few models of the second car left the plant. An American photographer by the name of Michael Keyser has good pictures of the wrecked second Indy car, but he owns them so I can't show them here. Great - many thanks for this insight ! Where was the second car wrecked, during testing in Germany or in the US ? And what about the monocoque offered for sale in Munich in late '72 - I reckon this was a spare monocoque ? By the way, could either Graham or our host please correct the heading of this thread to "Francis McNamara" ? Unless somebody proves me wrong I would think that this was his correct name. if you like i can ask armin stengele (fuzzi) about the indychassis . he made them at the time . i think in the "capriworkshop" down the street . Thanks, Roger - would be highly appreciated !! That looks very much like one of the Jochen Rindt Shows to me which would make it December 1970. Now, here's an odd one: TNF member "dwall" linked a photo from flickr to the 917/10 thread; a person with pseudo "digitalFRANCE" (apparently a British citizen living in France) had uploaded there a number of shots from "the mid 70s" from his "father's attic" (see mainly around page 25). Is anybody aware it had been shown in Silverstone in the mid 70s ? Could anybody add a precise date to this photo ? And above all: Is anybody aware this car had come back to Europe and where is it now ?? Not on point but maybe interesting - if you look at the results for '69 ETCC championship races you'll find the occasional reference to a McNamara Team 5.0 liter Chevrolet Camaro driven by Helmut Marko. Don't know much more than that but possibly shows the diversity of the projects undertaken by the team. Indy Car, F3, FVee, Interseries, and now sedan. Can anyone add to the 'disappearance' and 'Interpol' side of the McNamara story. Did Mcnamara build a sports racing car? I'm looking at a 2 liter sports car that is apparently a 1969 Mcnamara. The bodywork is very similar to a Lola T210. Problem is I can't find any references to a Mcnamara sports car! Did he spell his name Frances or Francis? I would expect the latter, in which case the thread name should be changed. No, they did not ! However, the car you may refer to has been built from the remains of a McNamara F3 car and clothed with a copy of the von Wendt T210 body. I have lost trace when someone in Freiburg sold it to Italy in the late 1970s but was surprised to hear recently from an Italian friend that something of that discription had turned up in Italy around that time. This car has come from Italy and has a Hewland Mk9 gearbox which would be F3 rather than 2 liter sportscar. Do you know if it was raced as a sportscar at the time - was it called a McNamara or something else? Sorry for a belated reply, Peter, I had to go back to my old hand-written interview notes from the early '90s for details ! This transformation was done by Bruno Dietermann, helped by Franz-Josef Kottmann, both of Menden, a town SE of Dortmund. They started from a McNamara F3 car by cutting out the center section and building it into a sports racer. Bruno recalled that the car had a Pedrazzani engine and a Hewland Mk.8 gearbox. Its T210 bodywork came from a disused negative mould they had to pick up from Karl von Wendt's rubbish ! Bruno told me from his recollection that the work was done in "1971/1972" which sounds about right: Karl von Wendt had raced his T210 during 1970 but apparently not during 1971. He also recalled that the car was sold less its engine to somebody in Freiburg: through different channels I then heard that it had been sold on to Italy. What is strange about this car is that I can only trace one single DNS as race participation, the "60 Meilen von Zolder" on 15/04/1973 in the hands of Bruno. What can be documented, though, is its history in the small ads of some German magazines: First offered in August 1973 with a new engine (resulting from its DNS at Zolder ?? ), its year of build is, indeed, given as 1971. Again offered in May 1974 "race-ready", its year of build has now "progressed" to 1972. And then in November 1976 it is being offered in bits and pieces: Extinguisher, clutch, Hewland Mk.8, frame with T212 body plus spare wheels etc. That must have been about the time it moved to Freiburg where reputedly a Simca engine had been fitted. The last time it made it to the small ads was in May 1979 when someone with a Freiburg phone number offered a "Lola 1300 Gr.6 Sportwagen". PS: Bruno always called the car a "McNamara"; only when sold on from Freiburg it converted into a "Lola". Thank you for that information, it is far more than I ever hoped to find out. I will let you know what happens with the car and if I find anything about where it has been during the 1980s. To whom it may concern!! My father was Dan Hawkes, is there anyone out there who knew him or maybe even worked with him in Germany or in the UK. I was 8 when he died and really know little of what man he was. Look at de mcnamara-racing.de website for more information. Peter Reinhardt in the Mc Namara Camaro Z/28 at Motodrom Hockenheim, September 14, 1969. This is one of those Penske Camaro's with vinyl covering. Mc Namara ran this car in European touring car races. I believe originally a FF McNamara here pictured in the paddock at Gurston Down hillclimb during April 2008. Now fitted with a 1600 X-flow and large wheels, presumably the chassis would have been similar to the F3? A minor point on spelling: Frances is normally feminine and the masculine form is Francis. Edited by D-Type, 01 January 2010 - 17:49. This magazine would do a two part series each year for an introduction to the new cars that would be at IMS. No credits other that the author was R.Raymond Kay. This is the #2 version of the Indy Car. The first tub had compound curves which were difficult to fabricate. The lower control arm (and the upper rocker arm) on the first car required a TIG machine, a huge jump for a shop which was accustomed to BRAZING tube frames together as if it was a bicycle racing shop. The jump to riveted construction and a monocoque tub was also a major jump. The technological changes that McNamara went through in only a couple of years with about 25 of us was mind-boggling, the costs and stress finally did in the company. Does anyone have any other pictures of the Indy car? Curious as I believe I have parts for it. Here is one of two of the uprights I believe are shown in post number 45. After browsing through old Autosport magazine, I found this interesting article on the McMamara Ford Capri.